My favorite Marianne's dress vs my Favorite Elinor's dress in the 1995 adaptation: You prefer ... ? For some reason, I still find it hard to believe that until recently, very few people were aware that the first adaptation of Jane Austen's 1811 novel, "Sense and Sensibility", dated as far back as 1971. After all, people have been aware of other Austen adaptations during this same period or earlier. Even the Wikipedia site fails to mention it, except in connection with one of the cast members. 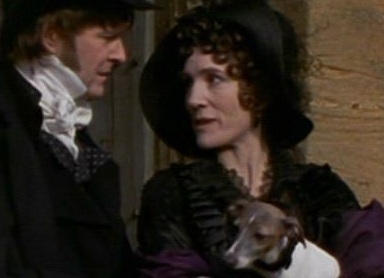 What was about this four-part miniseries that eluded so many Austen fans? The year 2008 marked the fourth adaptation of Jane Austen’s 1811 novel, "Sense and Sensibility". First aired on the BBC, this three-part miniseries had been adapted by Andrew Davies and directed by John Alexander. a comment was made to the poll: Marianne or Elinor? Who's your favorite sister? a comment was made to the poll: I know it's hard but...who do you prefer? What's the name of John and Fanny's son ? when you see the film, whom you remember? a relative? a friend? Brandon, Edward, or Willoughby - who would you pick and why?